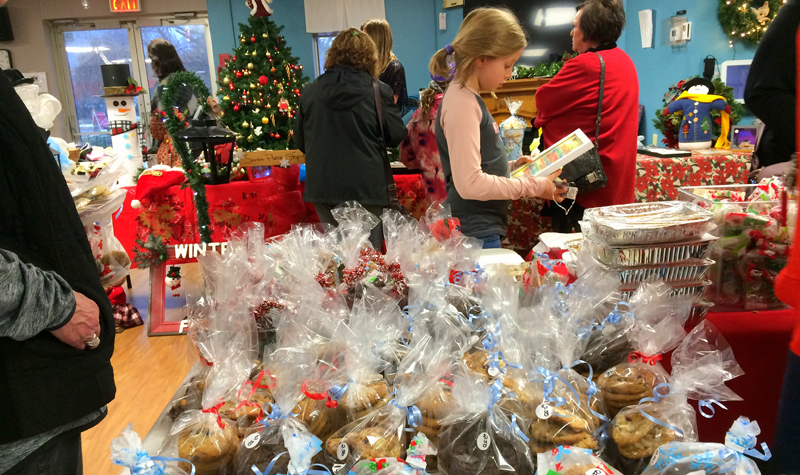 The Brighton long-term care home hosted its annual Christmas Bazaar. The event is Maplewood’s largest fundraiser, with all proceeds from the sales of the baked goods and crafts supporting the home’s residents’ council. This year Maplewood raised $1,700. “We were happy with our success in two hours work,” Maplewood life enrichment aide (LEA) Rosanne Blackburn tells The OMNIway. The LEA says it’s difficult to estimate how many visitors the event attracted but she says it was very busy for a solid hour. Patrons could purchase crafts and baked goods and/or bid on one or several of the higher-value items in an auction. There were pies, squares and cookies, along with knick-knacks, knitted items and holiday wreaths. The majority of the goods were handmade by residents and staff and the rest were donated by staff and family members. The atmosphere was lively and festive, complete with the home’s Christmas tree shining brightly in the dining room where the bazaar was held. The money raised specifically supports entertainment for residents, including a monthly birthday party with live music and a variety of outings. This past summer, residents enjoyed a boat cruise, lunch dates and a trip to the local theatre, which were just a few of the activities made possible from the proceeds of the 2017 Christmas Bazaar.